Yesterday my kindle arrived. I read quite a bit by some standards, about 1 hour a night in bed. I dont read fast, but if you add the hours up it ads up, so I go through maybe 25-30 books a year. 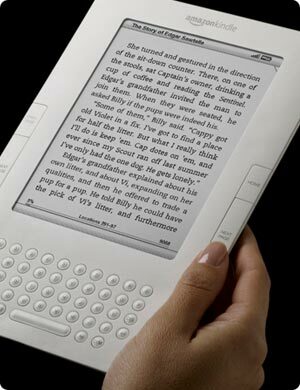 I have read about e-readers for years but always thought they werent for me, even though I'm an admited tech-addict. But the kindle started to catch my eye. I still wasnt sure until a friend of mine told me he has the Kindle 1 and loves it. The kindle 2 came out last month and decided to take the plunge. The "excuse" is you'd actually save money. In a years time I may buy 30 books avaraging $20 each. If I bought them as ebooks they would be $10 each. That savings would pay for a kindle in a year. But of course you dont buy a new tech toy to save money. In my case its a combination of convenience, and tech nerdism. I'm simply tired of ordering books and having to wait for them to get here, paying huge amounts of shipping (often more then the cost of the book) then stacking them on my desk or bookcase to read them once. I dont reread books ever. So then I have a pile of "read" books I have to find a home for. I end up sending them to my sister but I Have to put them in a box and mail them. The whole book buying and getting rid of is really a pain. Then there's the form factor. I read in bed typically and I dont like to have to use both hands. But with a paper book I have to to keep it open or it slams shut, or I have to use that squeeze in the spine trick to hold it open then hope my reading lamp on my chest doesnt slide down then I lose my place. Finally I'm getting old and my eyes are suffering. I need mild (1x) reading glasses or I cant read a typical paperback for long. So eyeing the kindle seems like it might solve all those problems! 1) instant delivery, with no shipping costs no books piling up to get rid of, no packing, boxes etc. 3) Hold in one hand. So I finally went ahead and ordered the kindle 2 ... Here's my first experiences. The downloading and book buying experience is great. You can buy books from the kindle itself (it comes with a web browser) but its a bit sluggish. I just went to amazon.com from my dekstop and bought a few books (free and otherwise). They appeared on the kindle within a minute. I didnt belive they would because I'm in an "Edge" area not "3G" but sure enough there they were. I love the "try" option where you can download the first chapter for free before you commit. I love the integration with the iphone kindle reader. I can read the same book on both iphone and kindle and it knows where I left off on either. The form factor is nice. DO get a case (I got the leather case), because the screen is known to be easily scratched. It feels good in my hands. A little heavier then a paperback but lighter then a hardcover. The text-to-speach is fun but I doubt I'll use it. Now for the negatives. There's a tad of an annoying black flash when you change pages. I am getting used to it but for the first bit I had to blink to avoid getting annoyed. Performance on anything except reading is sluggish. If your used to a desktop or even a good PDA you'l be thinking "what is taking so long" ... But for me this isnt a big deal. This isnt a general purpose computer. Its a BOOK. And for a book its awsome. The PDF to ebook translation is dismal. Some of my PDF's didnt translate at all readable and some were just "OK". But then its not claimed to be able to handle them well. Word documents transfered very well. The web browser is very sluggish but then I'm on an edge network (not 3G), and the fact it can do web at ALL is amazing. The screen is smaller then it should be, considering the formfactor of the full kindle. Its obvious they started with a e-ink display and built the box around it to make up for its small size. But its bigger then an iphone and reads much better. Its not bad. I'd like the screen bigger and would give up on the keyboard for a bigger screen. The only real disadvantage of the screen size is at the font size I like I have to change pages quickly but not overly annoyingly so. Overall, my first experience is that this works well for me and is worth it. I havent read a full book yet so I will see how it goes and post back after a month. Its been 3 weeks now with my Kindle and to my amazement I am even more happy with it now then when I first started. The problems are ones I can live with (slow net access, fairly clumbsy navigation to anything complicated) and the 'big problem' I thought I'd have, the blank screen flash, I dont even notice anymore. Its simply a joy to use. My only complaint ... MORE BOOKS !!!! I hope this will come in time, but as I peruse my favorite authors, many of them have little or no kindle presence, so I'm having to try out new authors, the ones with publishers smart enough to sign a deal with amazon. I guess thats not bad ! I've read 3 new authors now and liked 2 of them ... so more to them !